A Financial Plan - an essential part of a client’s investment portfolio. The professionals at PCWM offer financial plans that use the latest technology to build plans that consider the following aspects of a client's’ life: Income, Expenses, Savings, Investments, Real Estate, Mortgage, Taxes, Trusts, Wills, Insurance and market based modeling projections. PCWM MAIN BEACH - a high tech, high touch tool to monitor and update your financial plan, spending and assets. Clients use an app on their mobile devices or computers to access their plan, update spending, changes, budgets, and monitor individual investment holdings. Risk Analysis - The professionals at PCWM utilize the latest risk based tests and algorithms to determine each client's personal risk tolerance. 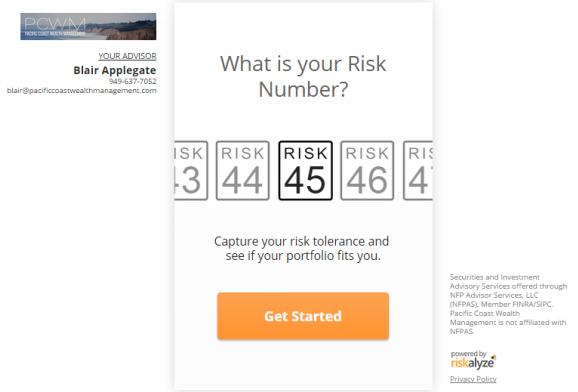 This risk tolerance test is compared to a test of the risk level of each individual investment account that the client holds. Your financial plan, personal risk tolerance and portfolio risk levels are all modeled to work together to achieve the long term goal of the plan.